This is one of the top destinations for tourists enjoying an exotic and memorable Christmas holiday in Viet Nam. Without white snow, frosty wind or chilly ice, you only witness a charming Ha Long Bay with its pristine beauty of thousands of superb islets, the gently cold breeze and sometimes with the sunshine getting warmer your winter holiday. 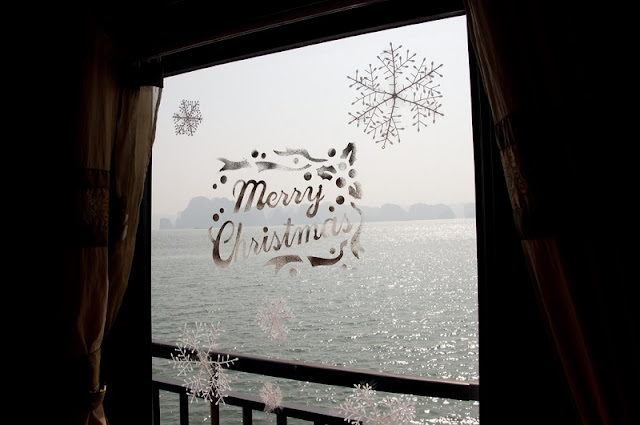 That’s why spending Christmas in Ha Long is getting to be a hot trend. In winter, most of the floristic cover on rock islets and inlands in the Bay shrink for a “sleep” to wait for the coming up spring, so the views is worth to be contemplating than ever. Actually, you cannot expect to witness the green spreading out the Bay because this is the charming of summertime in this place. However, it is favored by the nature with a particular fog cover instead, which creates an exotic fascination like an arty picture including rock natural architectures covered with the fog blanket. What can be more awesome than welcoming the first warm sunshine initializing a new day on your Christmas holiday among the superb landscapes with blue sky, immense green water bodies and imposing rock islets making the reputation of the Bay. In general, you can take a new day full of romance by walking around among the gentle fog and sometimes in some days when the fog is thick, it looks so amazing like you can cut it into block. Standing on the cruise’s deck or climbing on the halfway of an island then looking down, you just get the whole beauty of Ha Long in the fog. This is an illusory and spectacular image when the fog is gentle on the water surface and only the peaks of rock islets appear. 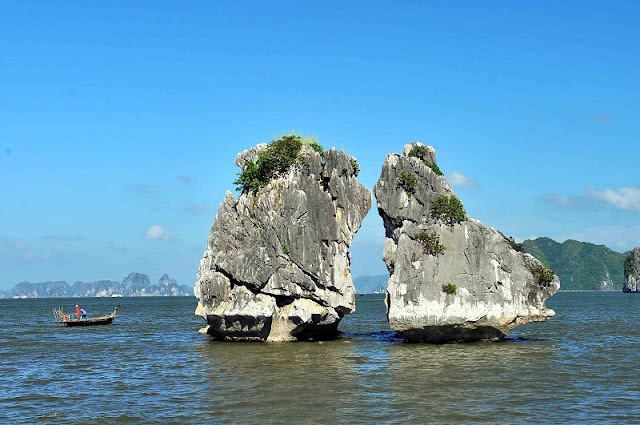 Mother of nature spend so much love to Halong bay: have blue sea, blue sky, so many islets and islands. Wonderful nature attracts wildlife. If you are lucky, you can see the langurs. Spending time to contemplate Ha Long at the morning is also a good choice because you can explore the early daily life of the local; take part in some interesting activities like going fishing squid, rowing an own boat. For whom staying the night on cruises, going by bamboo boats or tenders to experience the nightlife of fishermen and learn about the daily life here is a must. It is more exciting when you can work as a real fisherman by trying their activities like catching fish, going fishing squid and at the same time rowing the boat by or all way or staying at the cruise and then experiencing such activities. Discovering Ha Long in day light with splendid caves, breathtaking island and islets, and interesting treks then experiencing the nightlife in the Bay are two of the worth must-do than ever you should expect from your Christmas holiday in this destination. Usually, after a night catching seafood, small boats park together in each group of 4 or 5 ones and the women shall prepare breakfast for their families. Then they keep their work with new catching and the sound “knock, knock” made by the fishermen to engage fish echoes around is an attractive characteristic in an early morning in Ha Long Bay. If you intend to visit these spots at the early morning, you can be seduced by the routines of fishermen in a peaceful but busy and exciting atmosphere. And though it a little cold at night, it is not chilly at all, so Ha Long night experience is deserved a try, particularly being on cruise, which will be the most memorable impressions on your trip. Recently, winter travel to Ha Long is definitely a hot trend and lots of tourists are interested in visiting this one of world’s Wonders in the coldest season of the year. Spending time on the trails to Ha Long’s landscapes is always a must. You can pay visits to Yen Tu, Bach Dang or engage in countryside tours holding by travel agencies. Besides discovering the Bay and its islets and islands, it deserves you to spend time experiencing and exploring the culture, lifestyle and more on such countryside tours. When participating, you may visit villages of the ethnics, stay at the ethnic houses for a day and night, join in the local activities like planting vegetables, feeding animals, catching fish, collecting herbs and so forth. 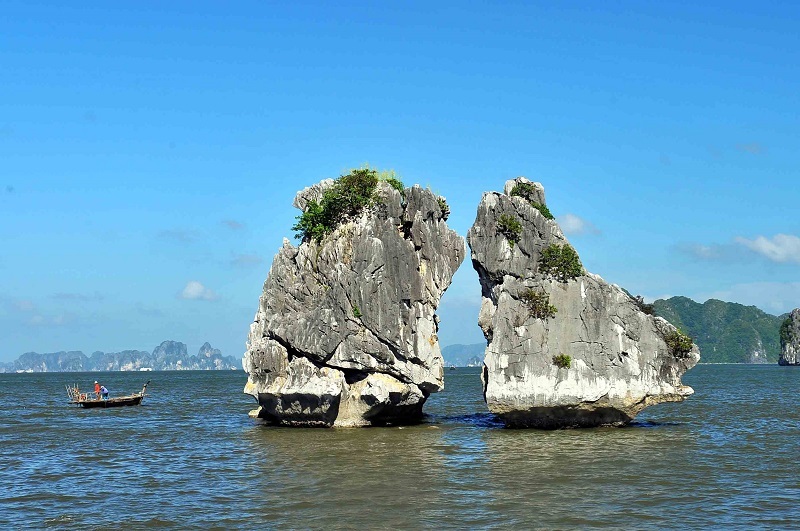 It must be so fantastic time that you only wish that you had more time to spend your holiday in Ha Long in the winter. In addition, you should visit Tuan Chau Island, which is the biggest one and the only island having habitation in Ha Long. Exploring the system of caves in the Bay is a high recommendation. Because of the charming beauty and unique experience that you only get in your trip to Ha Long, especially in winter, this tourism spot should be picked right now. You shall get one of the most memorable Christmas holiday in the land of pristinely wonderful landscapes such as Ha Long Bay.